For the first time since the Civil War time frame there are Black Bears in the wild in the Greater Louisville Metro Area. There had been a sighting in Hardin County KY and now there is also a bear - maybe the same one - around Bardstown in Bernheim Forest. Somehow one of the Kentucky bears crossed the Ohio River and got into Harrison County Indiana. It's only the second Black Bear in Indiana in 140 years, the other one was in far northern Indiana. Black Bears rarely attack humans, so both states' wildlife departments are leaving the bears alone and monitoring their locations with drones. The bears likely came from Southeast Kentucky and moved up the heavily forested Knobs. I saw that on the news! I love it! I say we call him/her 'Home' for welcome! The Indiana bear was last seen near Martinsburg in Washington County, which is close to where my wife's family lives. The bear is really covering a lot of ground. The Indiana bear could have come from Illinois, Michigan, Ohio, or almost anywhere. Why does anyone think it came from Kentucky? Do bears swim the Ohio river? This journey likely began near the West Virginia-Kentucky border, where there is a healthy population of black bears, Dobey said. Last Wednesday, a Kentucky wildlife officer did see a young black bear heading north in Robertson County. 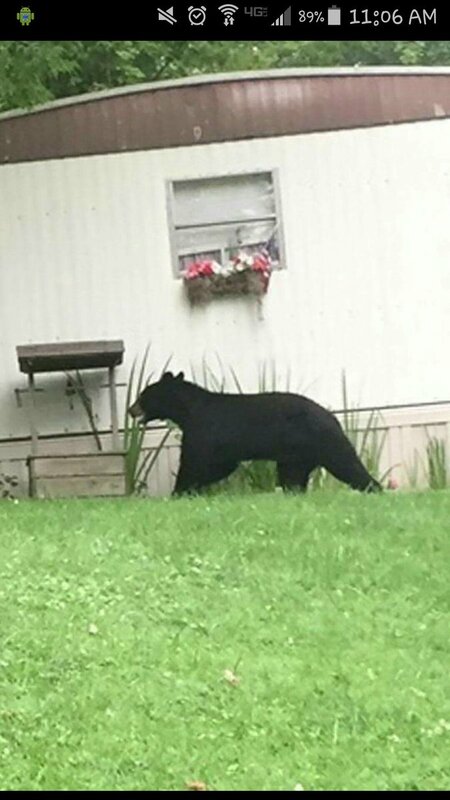 The bear was tracked into Bracken County, from which he eventually swam across the Ohio River and entered Clermont County over the weekend, Dobey said. Bears are good swimmers, and "what prompted this jokester to test his swimming skills, I don't know," Dobey said. "The river usually serves as a good border, but not in this case." Ohio Wildlife officials are taking a hands-off approach and are urging the public not to look for the bear so that it can continue its trek undisturbed. A bear could certainly migrate from Michigan (where there are many bears) down through Indiana but they couldn't move across 150 miles of open farm land without being seen. There was a bear seen near the Ohio River just across from Harrison Co near Ft Knox. I'm surprised it could survive swimming across a wide river with strong current but apparently it happens. At first people thought there was just one bear in the region but then a picture of the Bernheim Bear was taken after the other bear was in Indiana. If you look at a satellite image there is a ring of forest along the Knobs Region that connects down into the Appalachian Plateau. Where I'm from, they are common in the foothills and often come into the backyard of homes to investigate and take a dip in swimming pools. There are rarely ever any encounters where they are a threat to people. They are very good swimmers and would probably have little trouble crossing most rivers. I hope the good people of Indiana and Kentucky will allow them to roam unharmed. This is how they are dealt with in So Cal. Last edited by marino760; 07-23-2016 at 09:28 AM..